The sun was starting to set as we stood on the 8th floor rooftop looking at the rising towers of Center City just a few blocks to our east. A breeze swirled across the helipad, weaving through massive HVAC units, across a garden of ornamental grasses and perennial natives. It was mid-September and the low-growing succulents of the PECO Green Roof created a nice contrast with the yellow blooms of Coreopsis ‘Crème Brulee’ and the pinkish-red Gaura lindheimeri. Bees and butterflies buzzed and fluttered about the varied vegetation. It was hard to believe a city of concrete and asphalt bustled with automobiles, commuter trains, and scattered litter just eight stories below. View looking east from the PECO green roof. It’s probably even harder for people at street level to imagine a pollinator garden and grassy oasis, measuring over an acre, existing eight stories above on the roof of our region’s major electricity provider. 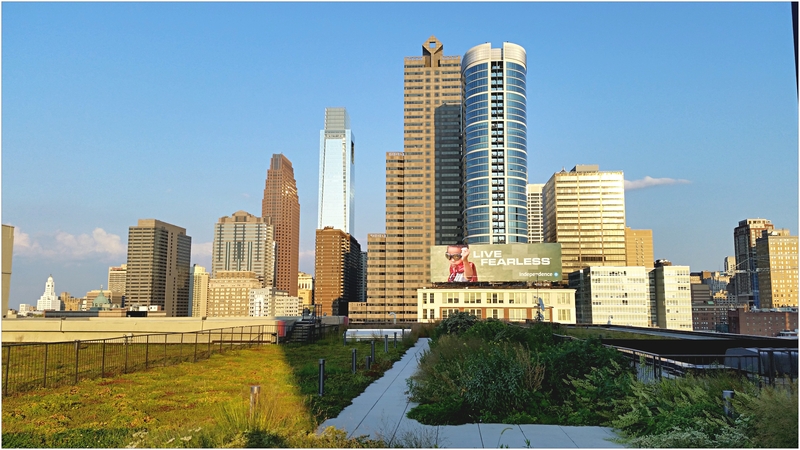 The PECO green roof, built in 2009 as a partnership with the Philadelphia Horticultural Society, is the largest green roof in Philadelphia. While other green roofs found on Philadelphia’s private residences, academic institutions, and businesses pale in comparison to PECO’s 45,000 square foot roof, they certainly still contribute to the health of our metropolis and add their own pieces of nature to our city. Helipad on the PECO green roof. When we talk about nature in the city it’s easy to neglect our roofs. From the street they are usually out of sight. Many roofs are hidden behind locked doors with signs that read Authorized Personnel Only, where HVAC units, antennae, or other aesthetically undesirable mechanics are housed. The PECO green roof is off limits, even to employees, unless you attend a scheduled tour. However, roofs pose a unique opportunity to inject nature into our city, in places we might otherwise not expect. As Philadelphia continues to expand its sustainability efforts the unexpected and seldom thought of roofs may play a significant role in helping to solve our city’s environmental issues. In 2005 the Schuylkill Center installed a 2,215 square foot green roof on a portion of our Main Education Building in an effort to display the many benefits associated with a vegetated roof. Green roofs help increase energy efficiency of buildings by regulating temperatures and decreasing the constant need for heating and cooling. They also provide habitat for wildlife and serve as havens for pollinators. 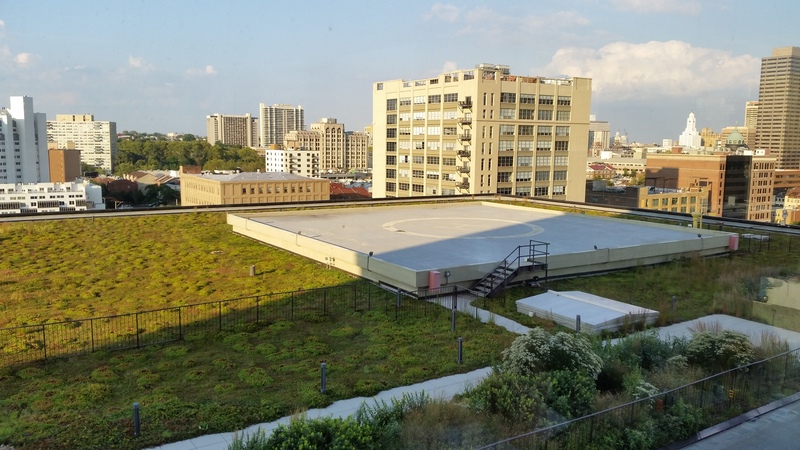 Most importantly to Philadelphia, green roofs act as stormwater management tools slowing the rainwater runoff to our overflowing sewers, in turn keeping our rivers and drinking water that much cleaner. Green roofs are just one example of functional nature in the city. Pollinator garden on the PECO green roof. Any sliver of nature, intentional or not, provides measurable worth across many disciplines and deserves our attention. Philadelphia is a city with a massive parks system, two major flowing rivers, and access to numerous wild areas within or immediately near city limits. We are fortunate to never be far from nature. Still, in this built environment we may lose sight of the natural beauty right in front of us. It’s this idea that makes the unexpected acre of green roof on the PECO building so magnificent. To find nature in the city when you least expect it, when you aren’t looking for it, can be just as wondrous as hiking through the wild back-country. It’s a testament to nature’s resilience and a reminder of our complex relationship with the natural environment, one of dependence and stewardship. Sure a green roof is designed, built, and maintained by humans but the bees, butterflies, birds, and vegetation are part of a system much larger than us. Only in the city are there opportunities for such large groups of people to exist with nature. So, the next time you’re on the street or on a roof, take some time to think about all these ostensibly hidden opportunities and maybe you’ll find nature in the most unexpected of places. This entry was posted in Miscellaneous and tagged Nature in the City, urban environment, urban nature. Bookmark the permalink. Corporate green roof gardens are a wonderful way to spread nature in unnatural places. This blog post is excellent, exciting, and inspirational. Thanks for such great writing! A very important dialogue! We need more smart green building approaches to be applied in city/suburban design — and, we have to find ways to provide affordable green methods and renewable energy solutions. Excellent article! I am very interested in planting on my home’s large black flat roof. Where do you suggest I go for guidance? Thanks for your question. A good book for reference is by Nigel Dunnet and Noel Kingsbury – called Planting Green Roofs and Living Walls. Roofmeadow is the company that installed the green roof here at the Schuylkill Center and could be a good resource to begin learning about green roofs and they are local, located in Mt. Airy. A good start would also be to check in with an engineer or green roof contractor to make sure your roof is structurally capable of handling the weight of planting and that you’ve considered possible drainage issues.